Hey y'all! 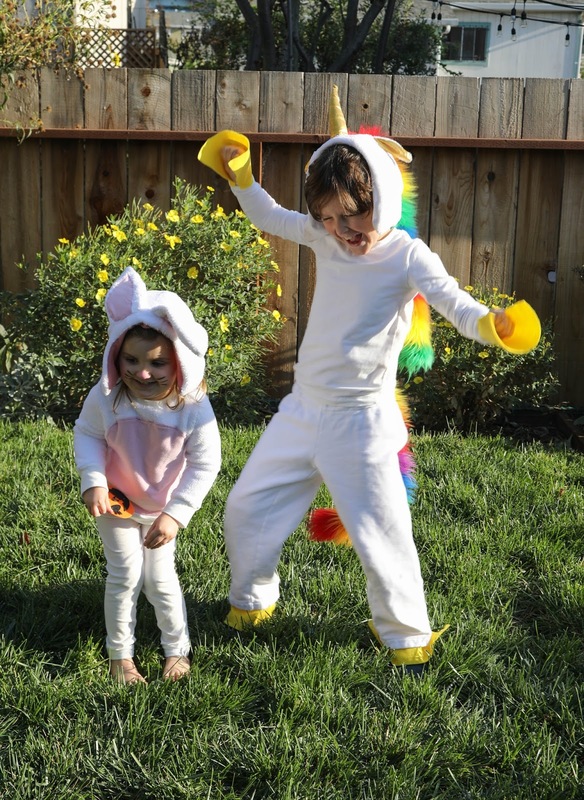 Just stopping in to share my kids' Halloween costumes, which totally derailed my Ottobre sewing of earlier October (still need to sew two t-shirts and a pair of sweats for Joe) but was totally worth it, because, please meet MAGGIE BUNNY AND JOEY THE RAINBOW UNICORN. 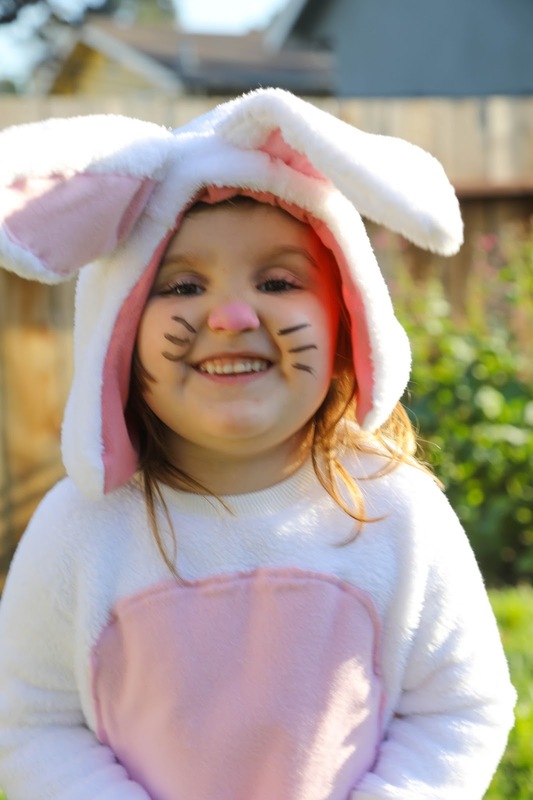 Maggie knew she wanted to be a bunny this year pretty early on, but Joe was waffling between a spider, Spiderman, or a unicorn (I know, random). Initially he just floated a couple references to unicorns, so I didn't think unicorn was a serious contender. But then after doing some Google searching (yep, that's right, this kid can search the internet on his own now! bring on the parental controls! ), he was dissatisfied with the spider and Spiderman options. It wasn't until quite late in October, when Joe saw the soft "cuddle minky" fabric I got at Britex for Maggie's bunny costume, that he informed me that he HAD to be a white cuddly unicorn! This minky is really ridiculously soft. On the one hand, I wanted to be like, "Couldn't you have told me this three weeks ago?" On the other hand, he had such implicit faith in my skills! As you all know by now, I am putty in this child's hands. Okaaaaay. At this point I was thinking that maybe we would do a blue and green mane, for a more "masculine" unicorn (who am I trying to kid?). But I took Joe to Stonemountain (this was a multi-Bay Area indie fabric store project! 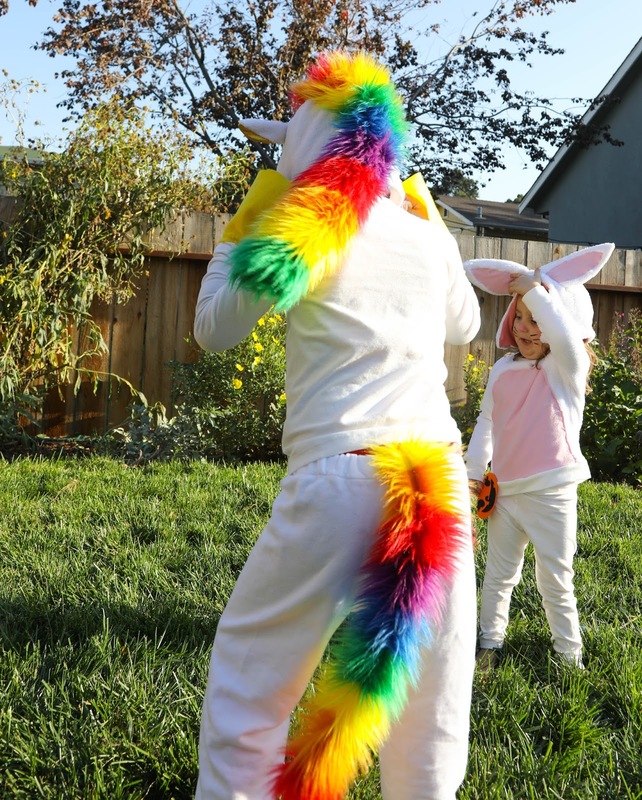 ), and he fell head over heels in love with this rainbow fur. It was LOVE, people. RAINBOW UNICORN LOVE. After it was cut, he galloped around Stonemountain, much to the delight of everyone present. What can a mama do in the face of such rapture? It was ON. Once the supplies were chosen, the costumes were pretty simple (albeit time consuming) to make. I made Joe's unicorn hood and Maggie's bunny hood using the "Cozy Winter Hood" pattern in Oliver + S's book, Little Things to Sew. This was my first time sewing this pattern, but I stood on the shoulders of giants. This pattern must be one of the most hacked and embellished indie patterns out there in the interwebs. A Google search of "Cozy Winter Hood animal" brings up hundreds of examples. And it worked a charm for me too! Both hoods are XL. My kids have big heads, almost as big as mine. Joe's horn is gold lamé, and the ears are lined with gold as well. Lamé has got to be one of the worst fabrics to sew. It frays, it gets snagged on everything. It's a royal pain. Luckily these were small pieces. I used thread to "spiralize" the horn, and tacked the thread down by hand. One of the weaknesses of the final product is the tendency for the threads on the horn to get unspiraled, but after a last minute repair (this hood was worn from the moment it came off the sewing machine), it seems to be holding up now. The horn was sewn onto the hood by hand, and the ears tucked in the seams. (I had to redo the ears several times - who knew that subtle changes in ear shape can change the look of an animal so much?) After the outside was sewn together, I hand-stitched the "mane" (an unfinished piece of fake fur) to the hood, then sewed the lining to the hood, right sides together, with all of that tucked inside. I am not even going to pretend to be humble about this hood. It might, seriously, be one of the best things I've ever made! HA! It is definitely one of the most popular and loved things I've ever made. Both of my kids have been wearing it nearly nonstop since I trimmed the last threads. Having seen it, I think everyone kind of wants one! 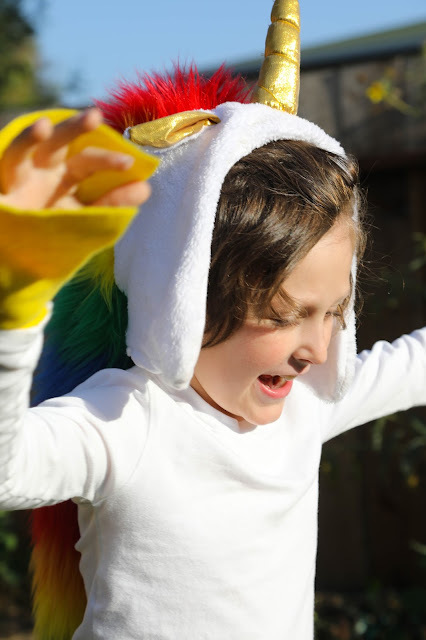 May we all be rainbow unicorns! I also made Joe's long sleeved shirt and white sweatpants. The pants are a simplified version of the Oliver + S Sleepover Pajama pants, omitting the cuffs and waistband. I just laid out those pieces next to the main leg piece and cut these out! This is a soft, thick, white fleece. The t-shirt is from Ottobre 6/2013 #34, a very simple long sleeved shirt, made from Laguna jersey. It's snug, almost like long underwear, which is nice for layering. I am wondering if I should dye the white duds so that Joe can get some more use out of them, since white doesn't stay white for long! We'll see if I can work up the energy for that after all this sewing. The tail is another piece of unfinished fur (did you know that you can tear fir across the cross-grain? and it makes hardly any mess and doesn't unravel? I am SO GLAD!) tucked into his pants because he didn't like the idea of a safety pin on his bottom. "But ... pins are POKEY." No amount of explaining would alleviate his fears, so tuck away! I whipped up some simple felt "hooves" for his wrists and ankles to complete the costume. Joe did a lot of galloping around! 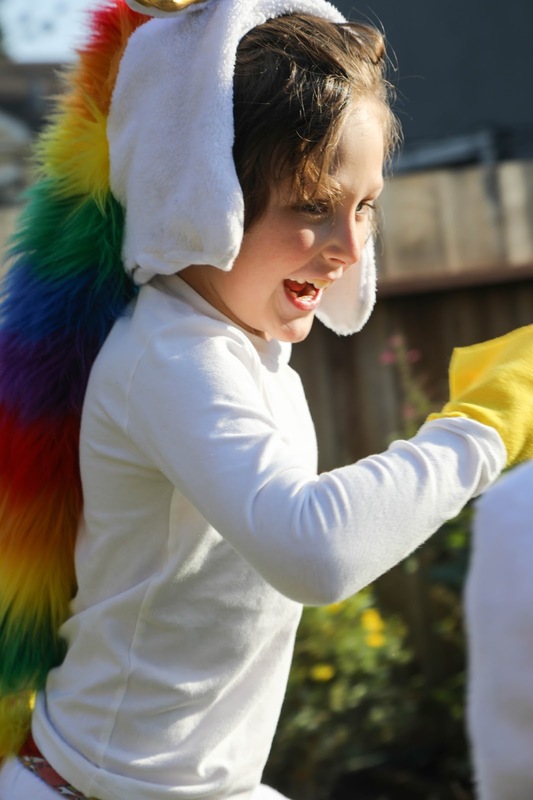 I was a little worried that he might get some negative comments, but all he got was high fives from his classmates and admiring remarks from fellow trick-or-treaters. 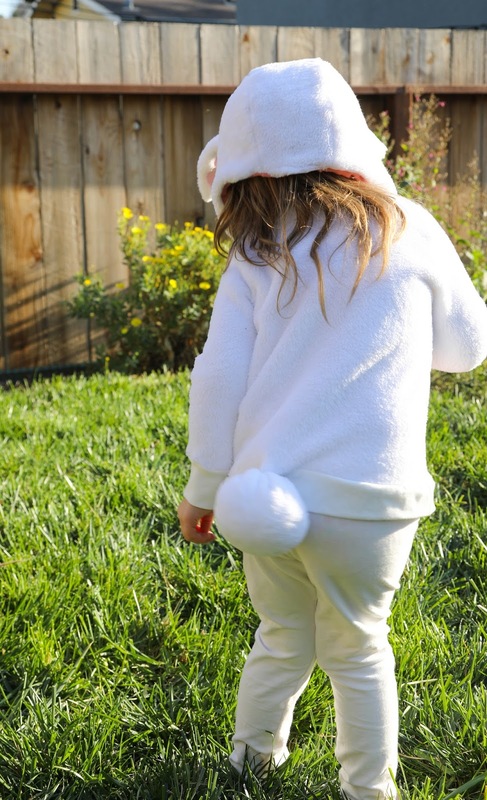 Now, Maggie's costume! The soft minky was intended for her costume, and I got the softed sueded pale pink jersey EVER from Britex for the details. I cut additional slits in the Cozy Winter Hood pattern for her ears, so that they would sit perpendicular to the seams. Her hood hack was not as successful as Joe's however. I could not for the life of me get those dang ears to stand up! I interfaced them with very stiff pellon, and even interfaced the top of the hood where they sit, but no go. I thought about wires but it was the weight of the ears that was dragging down, not the stiffness of the ears themselves. So then I tacked the ears back a bit, hoping that would help. But it didn't really. 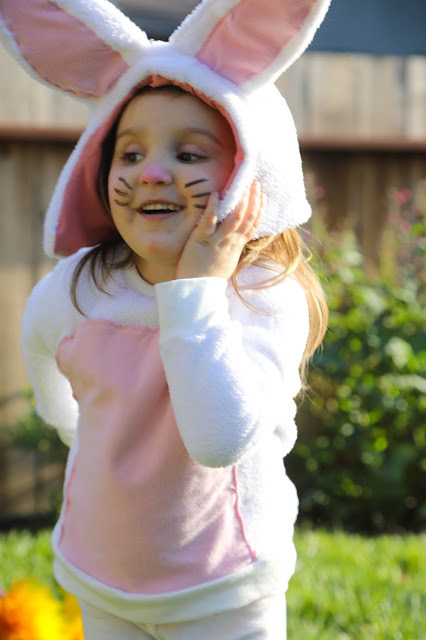 The ears flopped forward half the time Maggie was trick or treating, sigh. Oh well, they are pretty cute! Maggie's sweatshirt is made from the soft minky, with a sueded pink belly appliqued on, and Laguna jersey cuffs and waistband. The sweatshirt pattern is Ottobre Kids 6/2015, #15, which I made for Joe earlier this year and has a fun saddle-style shoulder. The leggings, also in Laguna knit, are Ottobre 1/2017 #3, the baggy leggings I've been making Maggie nonstop since last year. All she needed after that was a tail and some face paint! 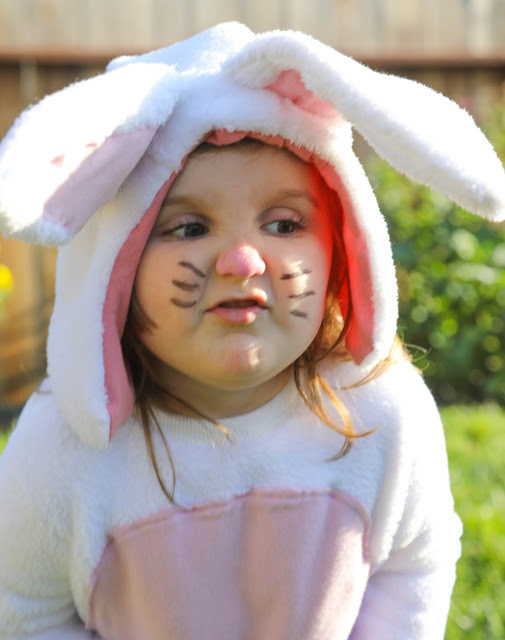 Maggie was very in-character as a bunny. Both kids had a great time trick-or-treating and the costumes were a hit! 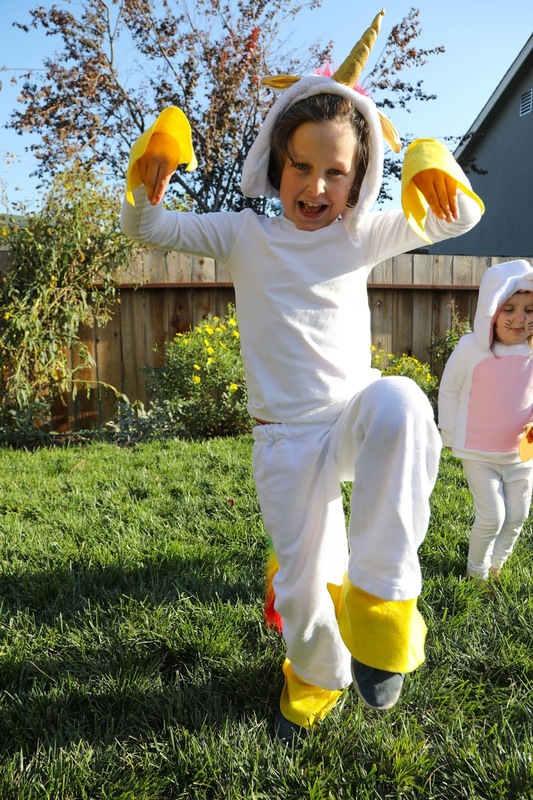 It's always such a crazy exercise, making costumes for my kids, knowing they will only wear them, IF they wear them at all, for a few hours. But I love that my kids still think I can make them ANYTHING, and they still appreciate mama-made costumes. Over the years, I've learned a few things about costume making (having suffered a few rejections in the past, ahem). Okay, actually, I've learned one thing: COMFORT. My kids told me that they did not want chin ties on their hoods, so there are no chin ties. Sure, some hoods blew off in the wind here and there, but no big deal. The outfits are made of soft knits. Nothing is too tight or uncomfortable, because my kids are not capable of wearing something even slightly uncomfortable, for 30 minutes, even if there is candy involved. Seriously. These were hard-won realizations! Final thoughts: I may never get the minky fluff out of my sewing area. I needed to press my black suit for a meeting this morning, and Steve was like, "why are you standing in your underwear, vacuuming off your ironing board?" I know YOU guys understand! I can't press my black suit in a pile of white fuzz. I am pretty sure I am suffering symptoms of minky inhalation (class action suit pending?). That said, I had a blast making these, and my kids are at peak-Halloween age now, so that made it especially fun! Aaaaaaaand I will be very glad to return to my regular sewing. Thank goodness Halloween only comes once a year! Joe: "I wish it was Halloween tomorrow too." Did you sew for Halloween? How much do you hate minky? Discuss! Oh heck, so much adorable here! Makes me at once a bit sad and a bit glad my kids are all moving past the age of fluffy costumes!! That confidence that mama can make anything is so inspiring though isn't it? Yay sewing! They are really fuzzy and nice to snuggle, now that I've sealed off all raw edges of minky! <3 Yes, this is a really fun age for Halloween, and I recognize it's a short time in the scheme of things, which is partly why I'm willing to drop everything and make costumes that they will only wear for a few hours. Plus they still think I'm some kind of super-mama! But it is a whole lot of effort! You really broke out the cute this year, Inder! So much soft white fluffy adorableness in one place! Good for you for making dreams come true on short notice. The joy leaps off the screen. Floppy ears on rabbits, by the way, are the BEST: I had a lop when I was a child, and floppy ears will look right and quintessentially rabbit-y to me forever. P.S. I always seem to comment on what you say rather than how you say it, but I really enjoy your writing. You make sewing sound so fun, so funny, and so possible to do prolifically. Aw, thank you, Medrle! That is a really nice compliment! I am capable of a more thoughtful or sentimental post occasionally but I must admit, humourous posts are my favorite! My husband gets all the compliments for being hilarious (he is really hilarious, that's why I married him), but sometimes I'm like, hey, I can be funny too, people! The kids were so into it this year. This is such a great age, and I really enjoy my kids' imaginations so much. If they think I can do anything, I feel like I can, in fact, do anything! But you continue to pretty much WIN HALLOWEEN in my book. Your costumes are truly the best I've ever seen. These two costumes are both so great! I love that you aren’t being humble about the unicorn hood— it really is incredible! I haven’t ever used that pattern (in fact, I haven’t used many of the patterns from the book and I should really get on that while my kids are still young enough!) but I want to make Caroline a cute little bear hood this winter. 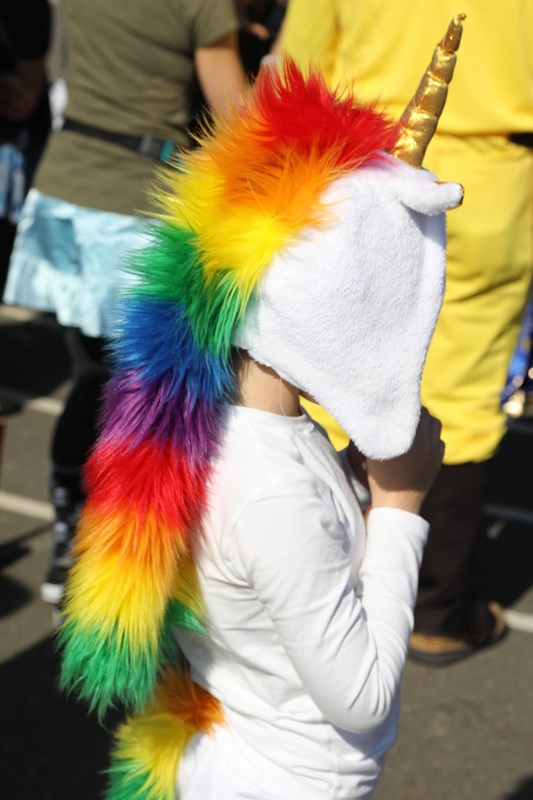 I’m super impressed with that unicorn horn and the rainbow fur! It is an epic costume and I hope Joe wants to keep wearing it for playing dress up. 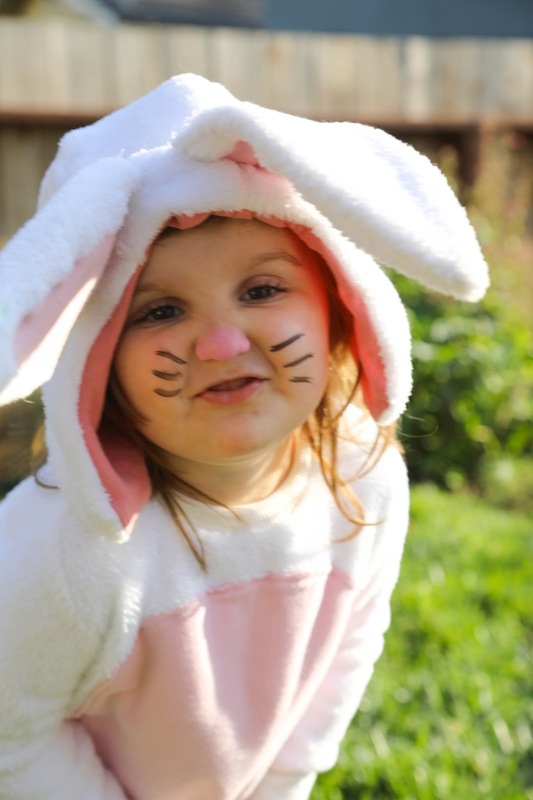 And Maggie’s floppy bunny ears are adorable, too! I made myself a new Lark tee as part of my burglar costume but otherwise I did no Halloween sewing this year. I was a little sad about it but I’ve already got a request for a skunk costume for next year! I’ll remember to keep away from the minky when I make it! I must be nuts as I love sewing costumes and often sew for our school (10 mermaid costumes, anyone) the chance to really make your brain work, I love it! PS Maybe some boning in the ears and the the seam may have facilitated stand up ears but floppy ones are very cute! These are so great! I hate sewing dress-up clothes so much, that these costumes seem even more impressive to me knowing how much I'd hate to sew them. They look fantastic. Oh please tell me you were in your underwear, vaccuuming off the ironing board WITH AN IPA IN YOUR HAND! I wonder if we could convince Liesl to team up with a veterinary anatomist and release a book of ear patterns from Aardvark to Zebra, to complement the Cozy Winter Hood.